A Girl and Her Grill | Now you're cookin' with fire! Now you're cookin' with fire! 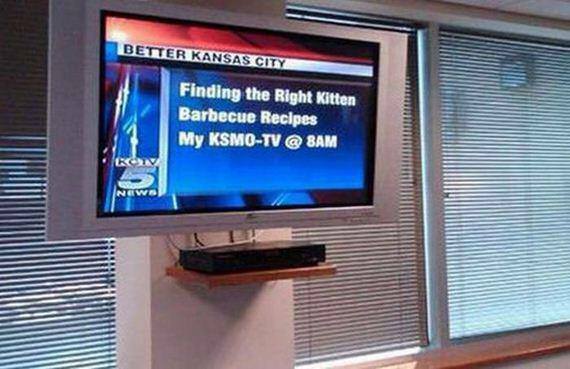 I pledge never to create a kitten (or any other pet) BBQ recipe! I think the director could have gone with a different story order here. Don’t ya think? Monday was a balmy 60 something degrees. I spent the entire afternoon outside, going for a run and then walking another hour and a half. Knowing what was coming later in the week, I wasn’t going to waste the sunshine and warm air. As I was walking, I was getting really hungry. I couldn’t get the thought of a juicy burger with melting cheese oozing from between the layers of a potato bun. Later when I stopped at the store to get what I needed, I did a quick search of the gourmet cheeses. I rarely go for the mundane American or plain old cheddar. I found a morel mushroom and leek jack cheese. Oh yeah! There is a small shop ( The Savory Gourmet )that sells cheeses and other snacky kind of foods in Lititz, PA that used to have a mushroom cheese (first introduced to us at Waltz Vineyards-excellent wines. My favorite is their Fusion). Eating that cheese was like eating a choice cut of beef. Awesome with red wine. This cheese that I found in the grocery store was pretty close. When I got home, I mixed into 1 and a half pounds of chuck (gotta have chuck, 80/20-need that fat to keep the flavor and juices and keep the burgers from drying out) powdered garlic, minced onion, a splash or two of Worcestershire sauce and a big splash of red wine vinegar or red wine. I formed 5 relatively equal patties, giving them a little indention in the center (see Simple Backyard Burgers for more on burgers). 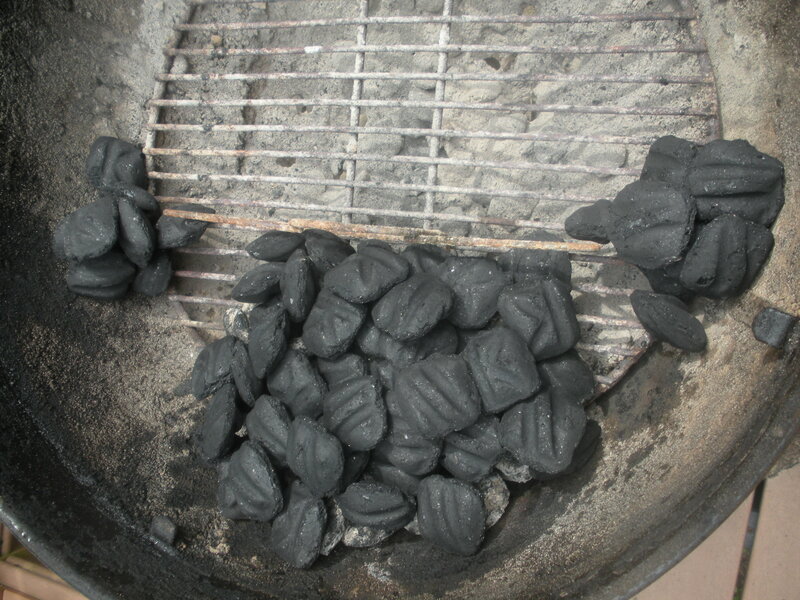 The patties went on the grill with a hot fire, coals evenly spread out. I had very few flare-ups. Not sure why, but that is a good thing. Near the end of cooking time, I moved the burgers to the sides, no longer over the coals. Slices of cheese were added, the lid went on for a couple of minutes to melt the cheese and voila! Juicy, cheesey heaven on a bun! The burgers were perfect-just a bit of pink in the middle and the mushroom and leek cheese was an excellent complement to the touch of Worcestershire and red wine vinegar. Sorry I don’t have pictures-just didn’t get them this time around. Until next time, Grill Baby, Grill! Should you ever find yourself in Savannah, GA, have at least one meal at Blowin’ Smoke Southern Cantina . My palate has had the pleasure of dining at Blowin’ Smoke twice. I was with my family on both occasions. We were sure to select a variety of menu items in order to sample as much as possible. Savannah is a long day’s drive from our home, so feasting at Blowin’ Smoke will not be a regular occurrence (our daughter is attending college in Savannah, so at the least, we will be able to eat at Blowin’ Smoke when we visit). The menu had a few changes from our first visit in July to our next a week ago. We were not disappointed in the changes. However, one side item we enjoyed on visit #1 was the Fried Macaroni-n-Cheese. It was switched out for Chipotle Mac-n-Cheese, equally tasty. The Fried Mac-n-Cheese was perfection the night we had a taste; however, our accolades were not enough to keep it on the menu. The Chipotle Mac-n-Cheese is a worthy replacement. The thick, creamy, spicy cheese sauce clings to long, firm, curly noodles. No runny sauce left on the bottom of the bowl! The spicy chipotle provides just enough heat to complement the mildness of the cheese. Other sides we sampled: coleslaw, roasted corn salad, sweet potato salad, spanish rice, black beans. If you like bland food, don’t order any of these menu items. Flavor reigns at Blowin’ Smoke. Each is sweet and savory with a bit of spice to liven up your taste buds. Other menu items include appetizers, salads, tacos, burritos, sandwiches and plates (these come with 2 sides). Quesadillas, listed under appetizers, are big enough for a meal. My younger daughter had the basic quesadilla filled with grilled onions and peppers, pico de gallo, rice, black beans, sour cream and queso. Delicious. You can add one of 5 proteins offered to fill it out even more. Over our 2 visits, the rest of us sampled chicken, pork and brisket entrees. All three meats are smoked in-house using pecan wood. The hand-pulled pork sandwich is topped with coleslaw and fried onions; the smoked pork enchilada is covered with ancho mole sauce and queso. The pork is tender, juicy and full of flavor all on its own. The fully loaded burrito is bursting with black beans, rice, pico de gallo, peppers, queso and smothered with chipotle sauce. My daughter added the smoked chicken, equally flavorful, tender and juicy as the pork. Brisket is a difficult meat to smoke (or cook for that matter). It takes many hours and lots of liquid to get it tender and keep it from drying out. Blowin’ Smoke has it figured out. The brisket just about melts in your mouth! We had the brisket finished with the house BBQ sauce. It was perfect for the beef. The texture is similar to that of apple butter with a sweet start and a lingering spicy finish. Our first experience at Blowin’ Smoke ended with fried ice cream and the dessert special, Chocolate Coffee Flan. I think the CCF should be on the menu all the time! Dessert on our second visit was the special, Maragarita Cheesecake. Rich and creamy, similar to key lime but with a hint of saltiness and tequila. All of these desserts were topped with lightly whipped fresh cream. Delicioso! At Blowin’ Smoke, they ain’t just blowin’ smoke! 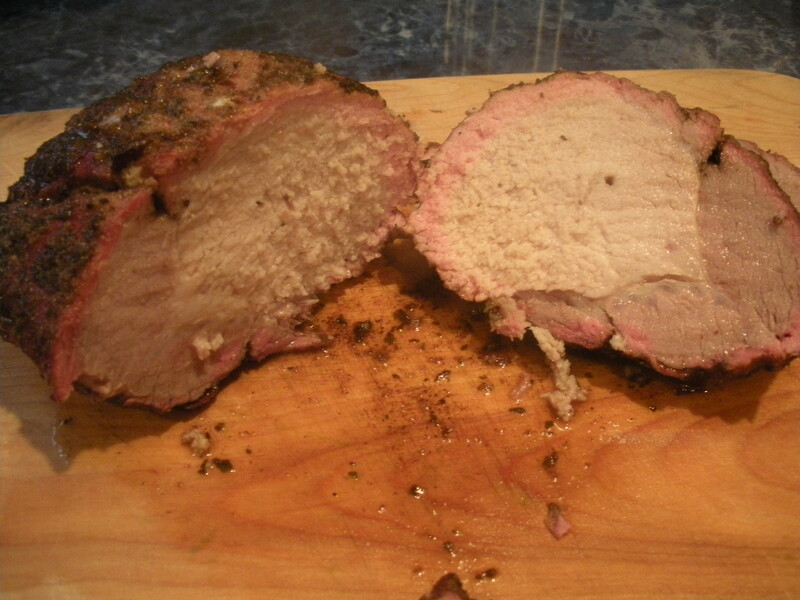 Last year (almost a year to the day I find), I posted Smokin’ Chick’s Beef Brisket. I smoked another one recently-my husband says it was the best brisket he’s ever had! He said the same thing last time. I guess I’m 2 for 2 on brisket. 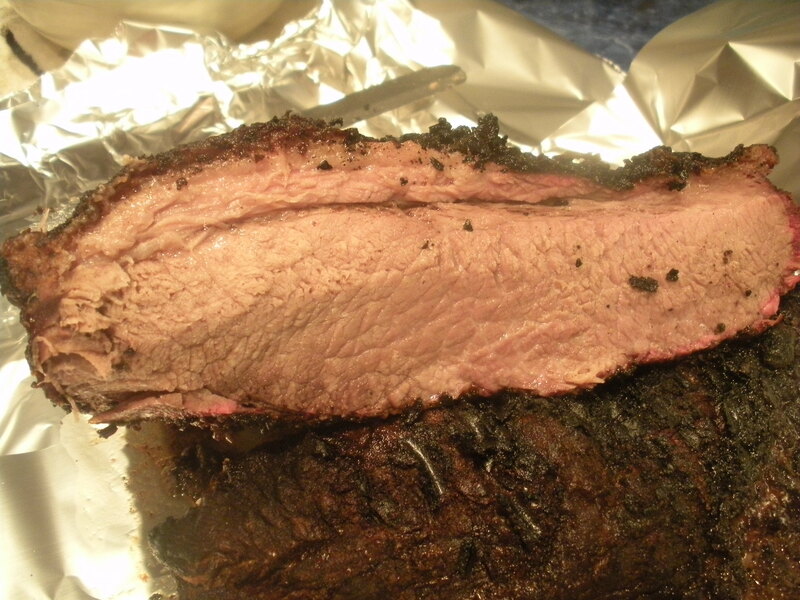 Some people are intimidated by a brisket or any cut of beef that is known to be tough. Low and slow with plenty of moisture is the way to cook those cuts. My brisket was 8.33 pounds. 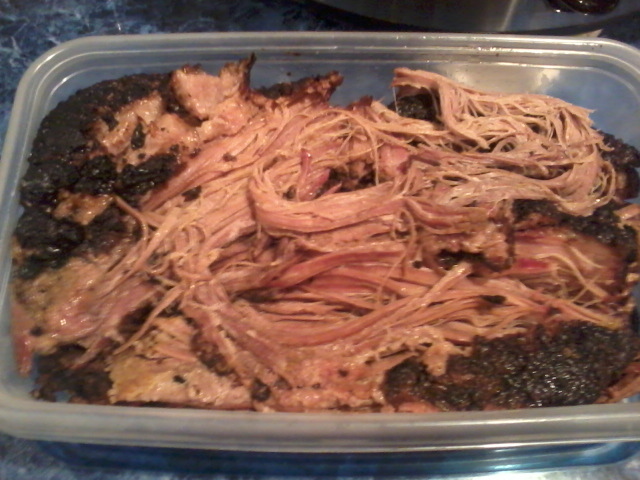 It was smoked on the grill just under 3 1/2 hours, then in the crock pot on low for another 8 or 9 hours. It pulled apart quite easily and was very moist. The rub gave it a nice coating and flavor that required no sauce (but I use sauce anyway). If you don’t want it pulled, make sure you slice the meat against the grain and not with it. For the rub you will need: allspice, garlic powder, onion powder, ground mustard and ground ginger. Place the brisket over 2 sheets of plastic wrap, layered over each other at right angles. I just sprinkled the spices over both sides of the brisket liberally and rubbed them in. 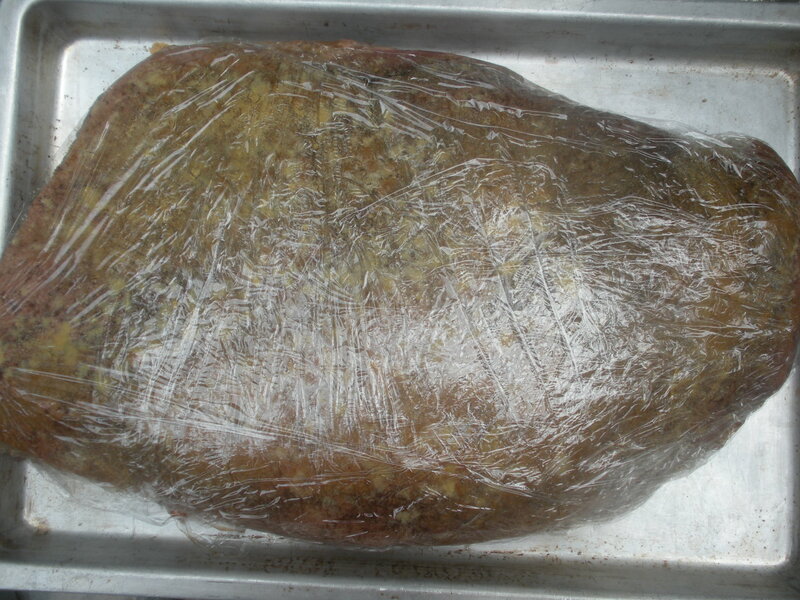 Wrap the brisket tightly and refrigerate overnight or at least 8 hours. 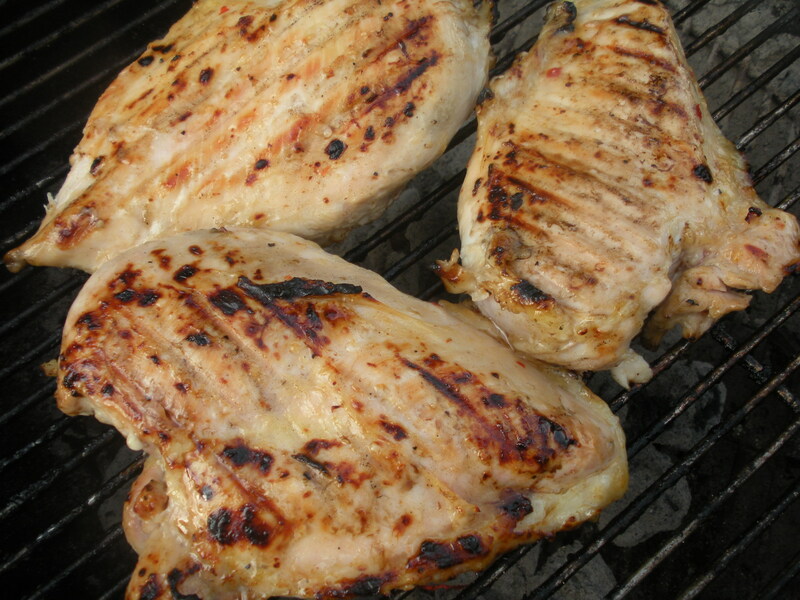 Pull the meat out of the refrigerator about 30 minutes before grill time, to relax the muscle fibers. Prepare the coals and soak the wood you will be using for the smoke. 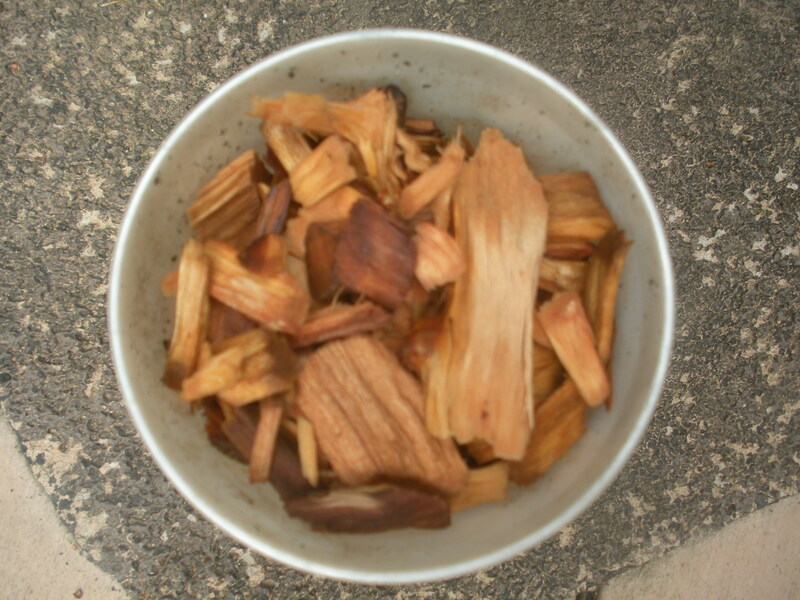 I used apple wood chips (I purchase the wood chips from Lowe’s if I don’t have any oak or cherry wood chunks from the trees on our property). 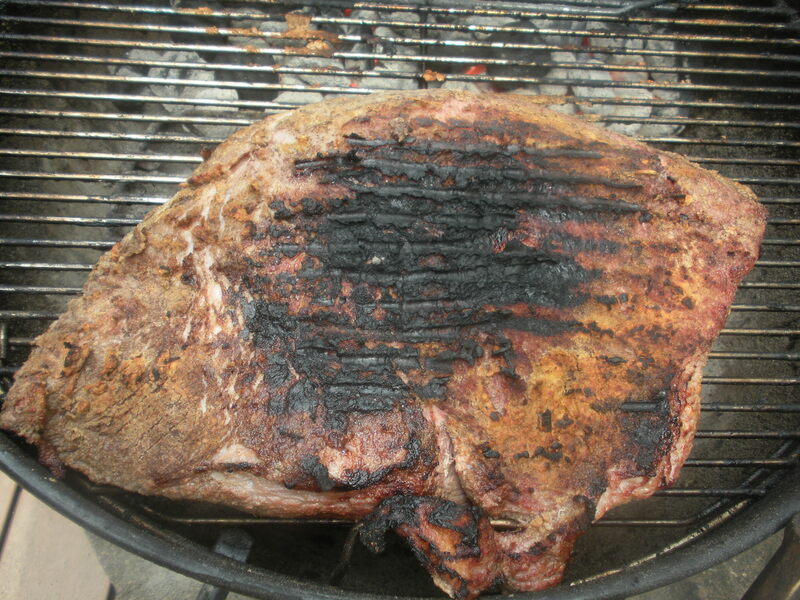 When the coals are hot, sear each side of the brisket 3-4 minutes to seal in the brisket’s natural moisture. 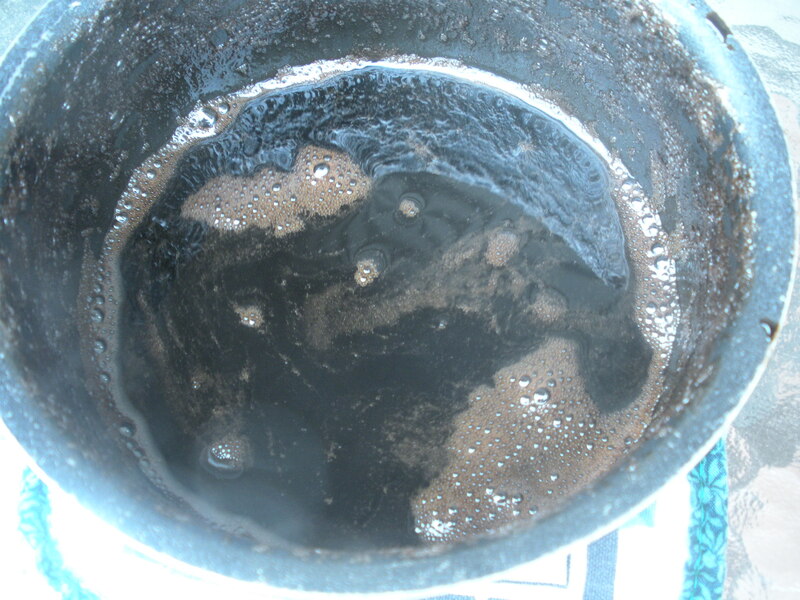 Opposite the coals, on the coal grate, place a foil pan filled with a liquid. For this brisket, I used cranberry juice. 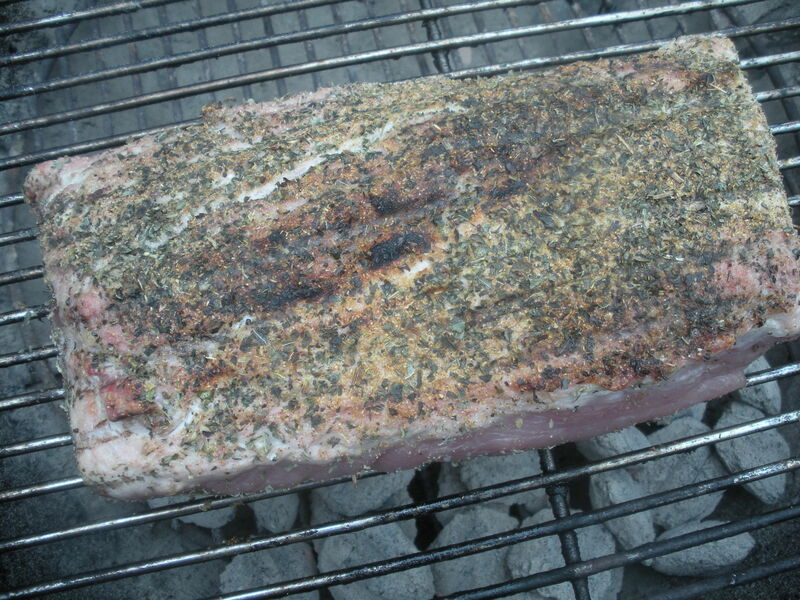 Once it is seared, move the brisket to the opposite side, fat side up, add more coals to the main pile and close the lid. The temperature peaked at 325 degrees F. I had all vents on the lid and the kettle wide open. If the temperature gets above 325, adjust the vents to regulate the temperature. The more open the vents, the more oxygen and air flow gets to the coals. Closing the vents a bit will decrease the oxygen and air flow, thus decreasing the temperature. 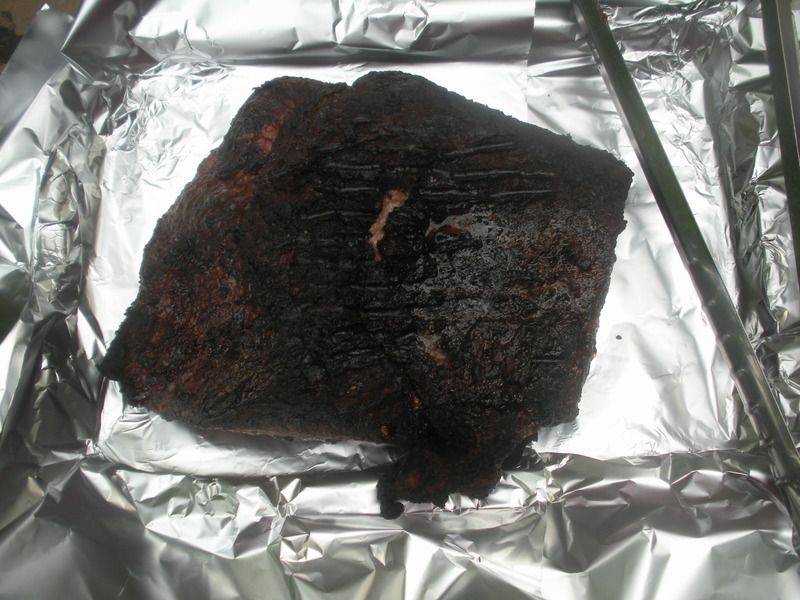 Once the temperature dropped below 250, I took the brisket off and wrapped it in foil to further cook and then cool. I was saving the brisket for a later time, so it went in the freezer for a couple of days. I took it out the day before I was putting it in the crock pot to thaw in the refrigerator. For the crock pot, I kept the brisket in the foil, opening it, but forming a bowl from the foil. I poured enough water around the bowl to provide enough moisture for a lengthy time in the crock pot, but not so much it would get into the foil bowl. I did not want to take my brisket for a swim! The brisket slow cooked between 8 and 9 hours. Until next time, Grill, Baby, Grill! I enjoy coming up with new rubs, marinades and sauces for pork. Pork is one of those meats that just about anything goes. The tenderloin is my favorite cut of pork. I buy the 10-15 pounders when they are on sale and cut them up when I get home. I leave bigger sections, such as the 2.5 pounds used in this recipe, and pork chops any thickness I want. The sections are then put in freezer bags and frozen until I’m ready to grill! 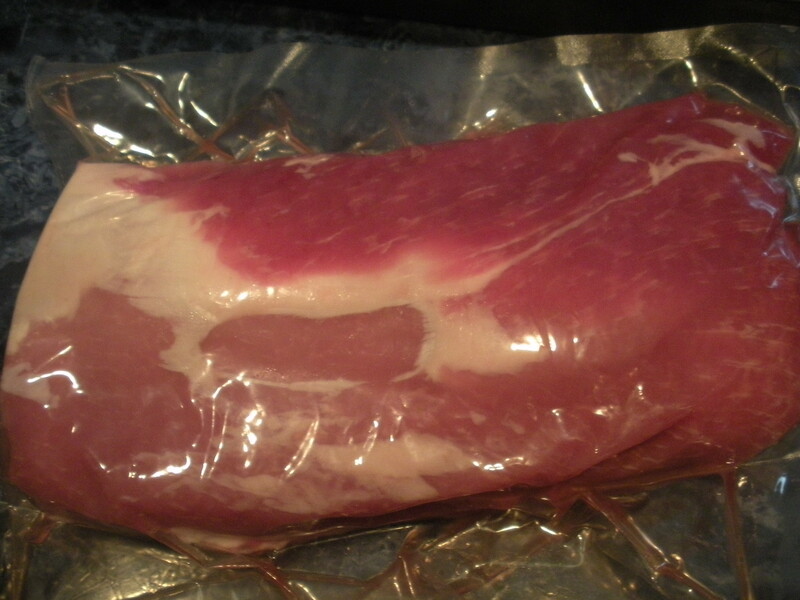 What you need: 2.5 pound boneless pork tenderloin, rinsed and patted dry with paper towels. Sprinkle all liberally (except maybe garlic-you might want to do that lightly) over all of tenderloin. 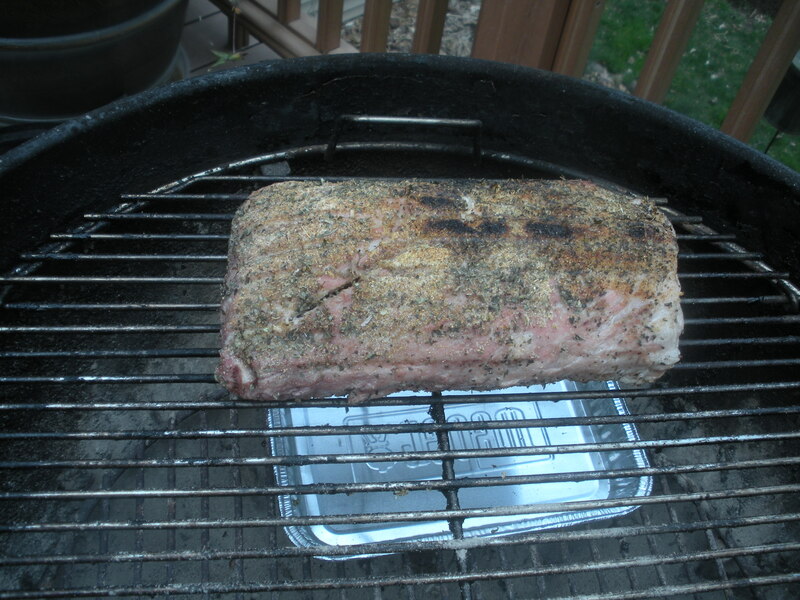 Rub in, cover the tenderloin and refrigerate for at least an hour, removing about half an hour before grilling. 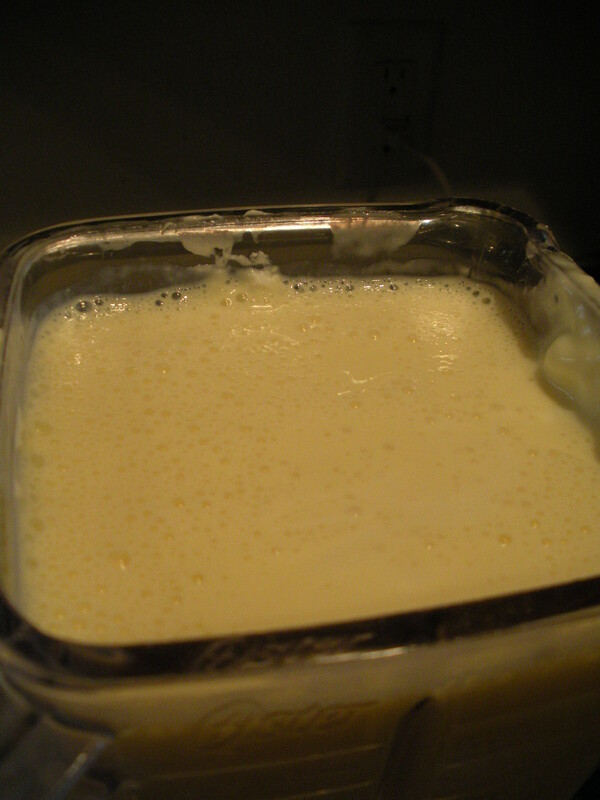 Bring to a boil, reduce heat and continue heating until volume is reduced by half. Let cool to room temperature. Prepare a fire for indirect cooking. Spread coals when most are ashen and temperature is high heat. Sear all sides of tenderloin, about 5 minutes each side. Remember to NOT use a fork to turn the meat. No piercing! Watch and put out flare-ups when searing the fatty side. 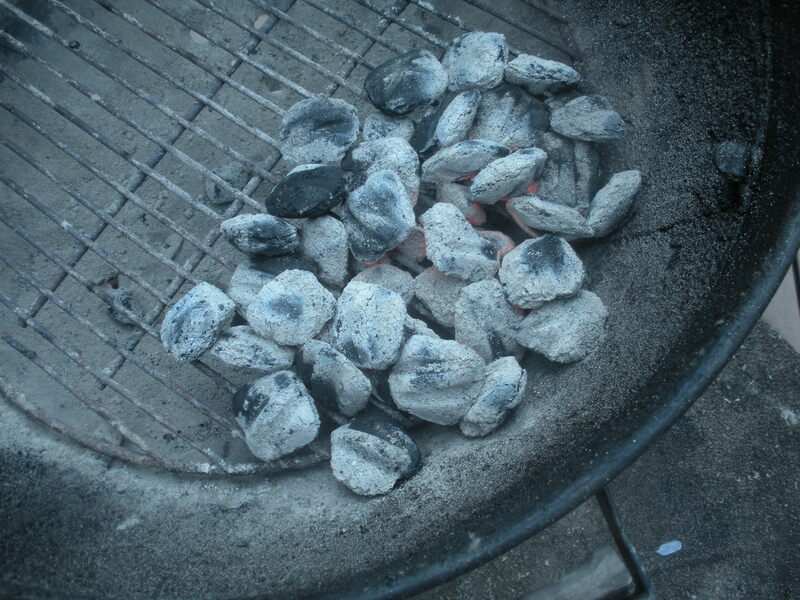 Move to the side of the grill opposite the fire, fatty side up and add more charcoal, about 5 briquettes. For pork, I sometimes insert a thermometer to make sure it is done. Internal “doneness” temperature for pork is 150-165 degrees F. Brush some of the glaze on the top of the tenderloin and put the lid on the grill. 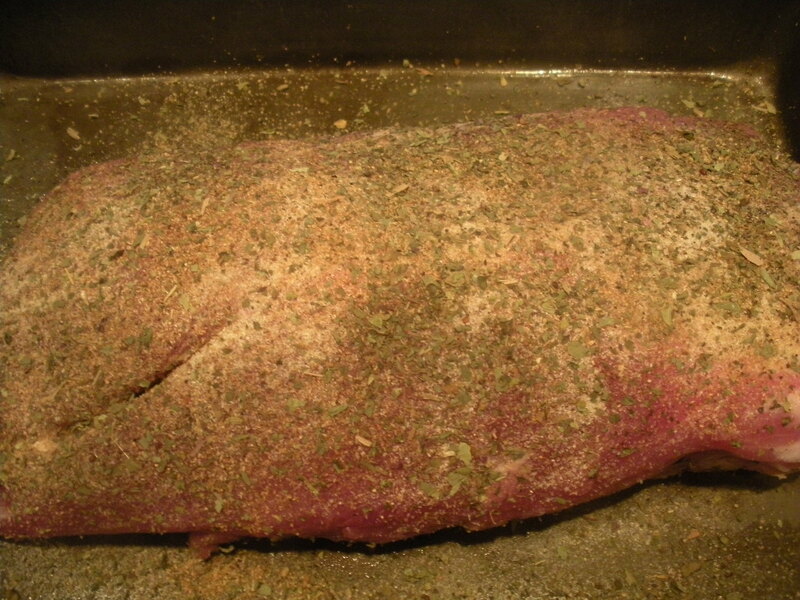 If you can maintain a cooking temperature around 300 degrees, a 2.5 pound tenderloin should be done after 2 hours. Mine wasn’t, so I brushed more glaze on it, wrapped it in foil and finished it in the oven at 400 degrees F for about 20 minutes. I served the pork with a caprese salad. This link takes you to a recipe. 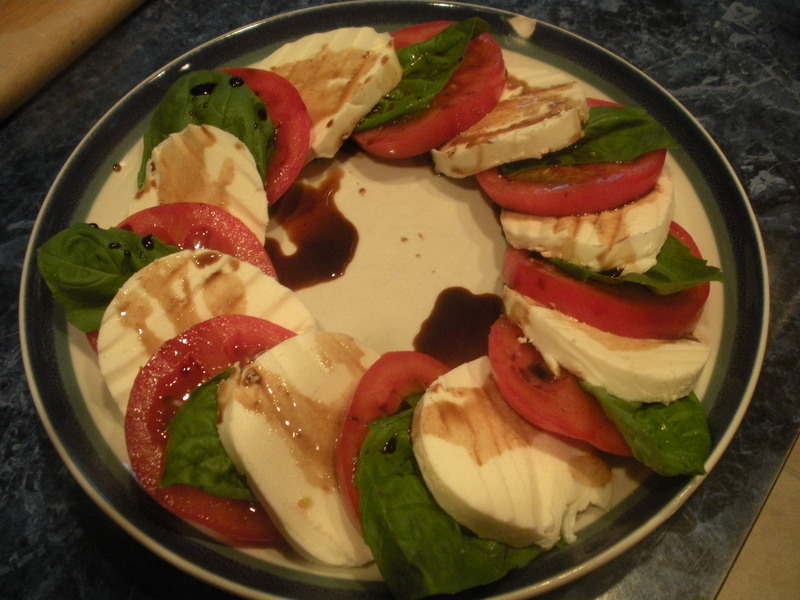 The only difference in how I serve it and this recipe is that I dress it with olive oil and balsamic vinegar. Sometimes, when I have no ideas for dinner, I will go to the grocery store or farmer’s market and wander around looking for inspiration. 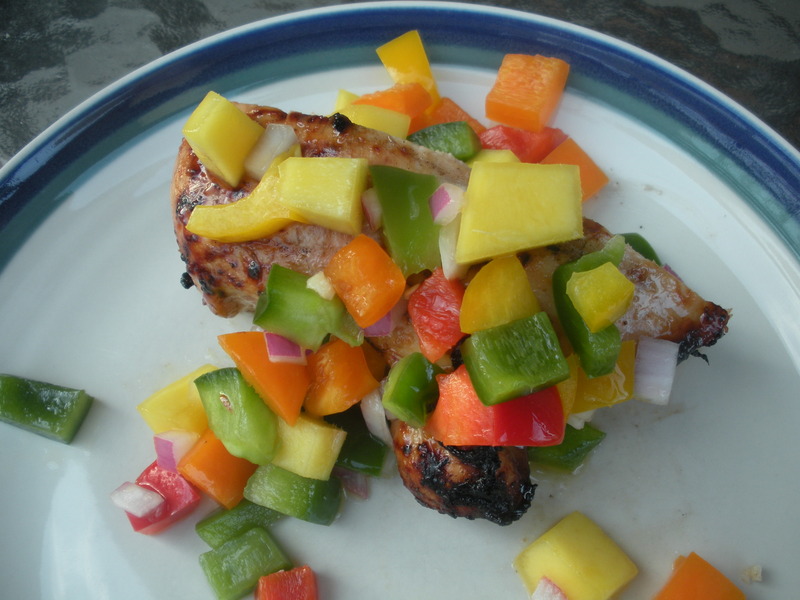 Mango Chicken Salsa is one of those inspired dinners. 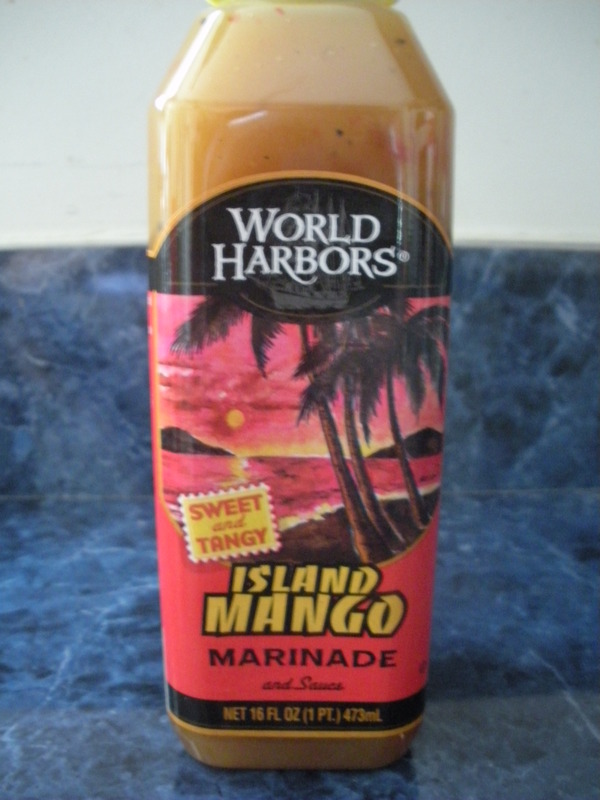 I used a pre-made mango marinade that is pretty good. Good enough that I marinated some pork chops in it last night. The Mango Salsa below is similar but slightly different from the Mango Salsa recipe found in Shrimp Soft Tacos with Mango Salsa. As you see in the picture above right, the salsa ingredients are very few. What is there makes a large batch, but there are plenty of ways to use what is leftover. 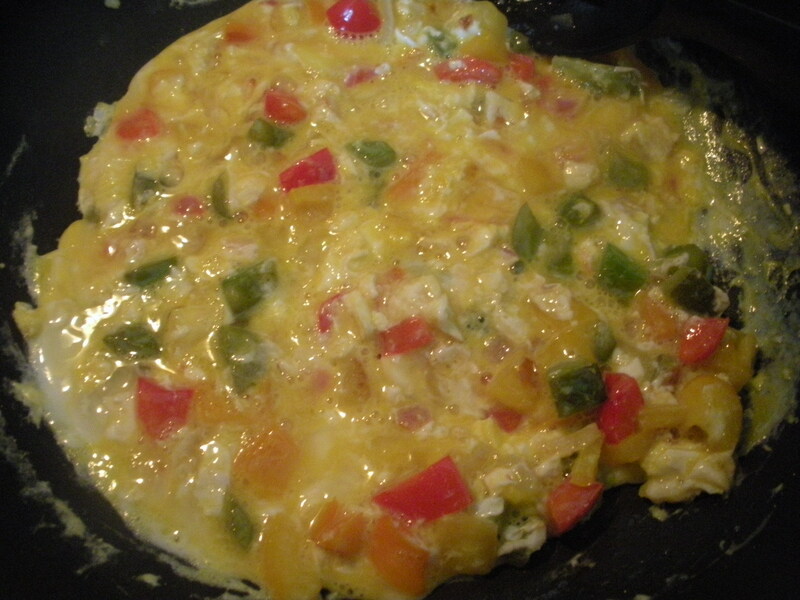 I sautéed some of it and broke a couple of eggs into the skillet and had an omelet. I had about 3 pounds of chicken breast (any chicken parts will be fine, you will just need to adjust the time on the grill). 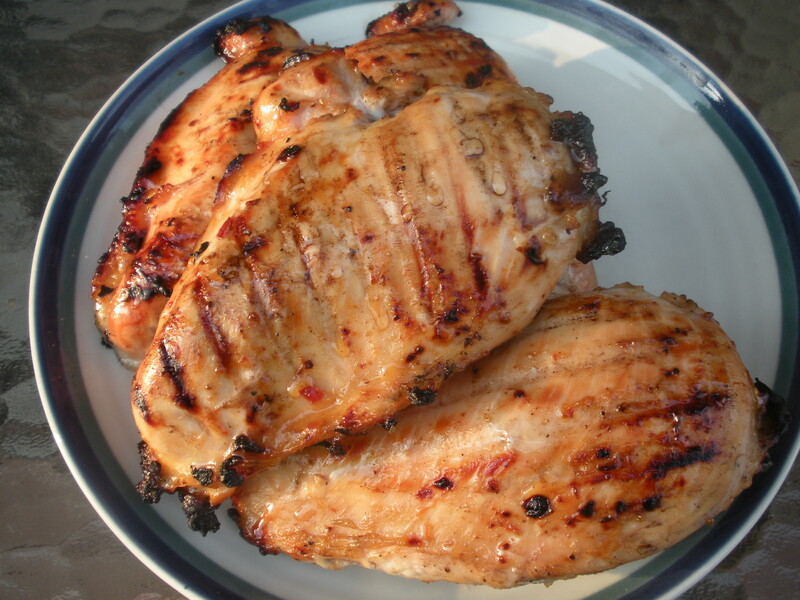 Put the chicken into a resealable plastic bag and add about half (8 ounces) of the marinade. Seal, shake and refrigerate for at least half an hour. Take it out when you start-up your grill to relax before putting on the heat. Grill over a hot fire (see Method Cooking for charcoal temps), at least 5 minutes each side. Since the marinade is sweet, it will carmelize as it grills. If it starts to smell charred, however, you’ve had it over the coals too long. 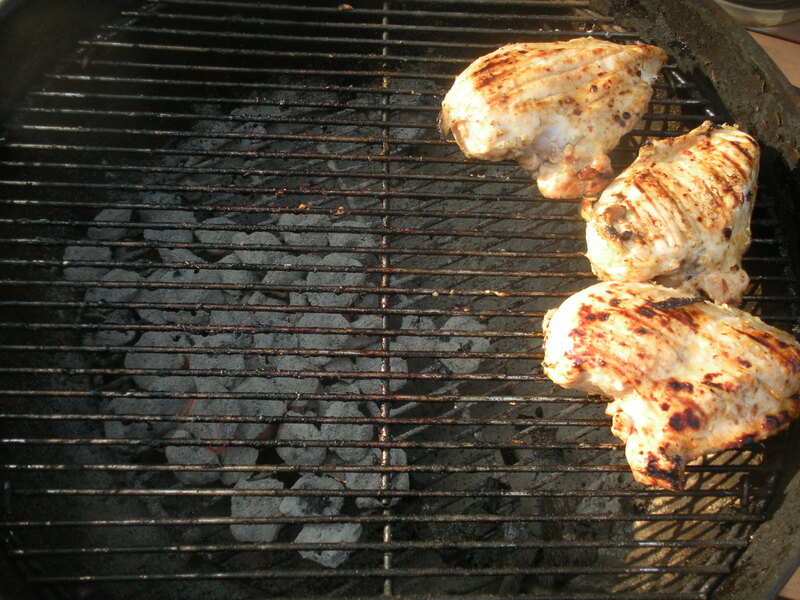 Move the chicken to the side opposite the coals and cover the grill. The chicken was ready to come off of the grill a little over 20 minutes later. 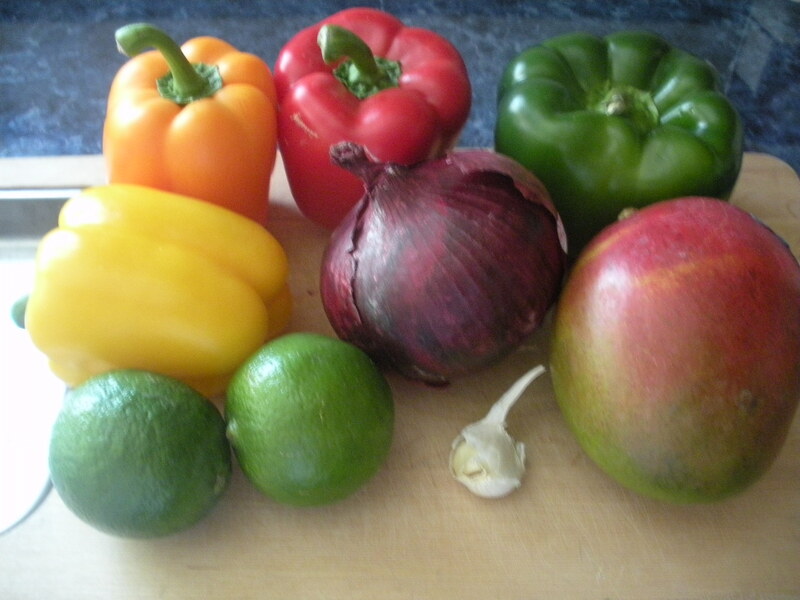 For the Mango Salsa: 4 medium sweet peppers, 1 red, 1 green, 1 yellow, 1 orange, all diced; 1 large mango, diced; 1/2 red onion, diced; 1 large garlic clove, minced or pressed; the juice of 2 limes. 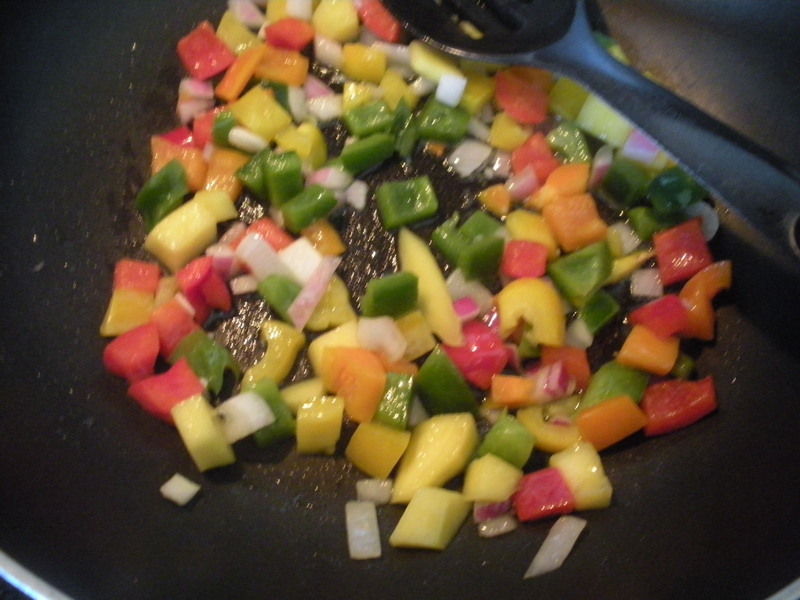 In a large bowl, put diced peppers, mango and onion. Add the garlic and mix thoroughly. Juice the limes directly over the salsa and mix again. My bowl has a lid, so I also gave it a few really good shakes. If you prepare the salsa the morning before serving or even the day before, the peppers, onion and mango will soften up a bit and the flavors will meld a bit more than if you wait to prepare just before serving with the chicken. I love super fresh, so I made the salsa while the chicken was marinating. Spoon the salsa on the chicken and enjoy! Fried or grilled potatoes and steamed broccoli and/or carrots will round out this meal. Sometime soon I need to post my method for potatoes on the grill. I just looked through my blog and see that I have yet to do that! It happened later than I would have liked, but weather and time always play a factor when grilling with charcoal or wood. It’s harder to maintain the heat when it’s cold! And the first grilling of 2013 took place Easter weekend, so it was a while ago. Today’s post is not a recipe. Rather, it is a testimony. I am not overly fond of sausage. However, since the day looked good for grilling and I didn’t want burgers, I chose some yummy looking sausages at the butcher counter. 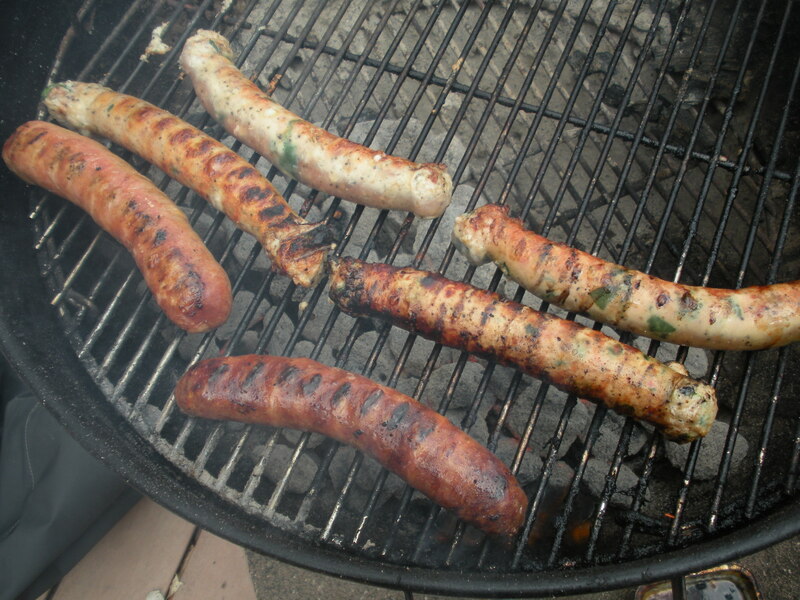 There were fresh made brats and chicken sausages to choose from. I chose chicken with feta and spinach and chicken with feta and sundried tomatoes. Oh my gosh, they were so good! Nothing beats fresh. I don’t even remember what it was that I cooked on the grill! So, don’t forget to clean up your grill! Happy Grilling, now that the season is finally here!! I’m dying to spend time outside on my deck. Weather is looking pretty good for the next couple of days to do just that, but my schedule this weekend is going to prevent me from doing so. I just hope Mother Nature isn’t putting us on and really means to allow us to have Spring from here on out. 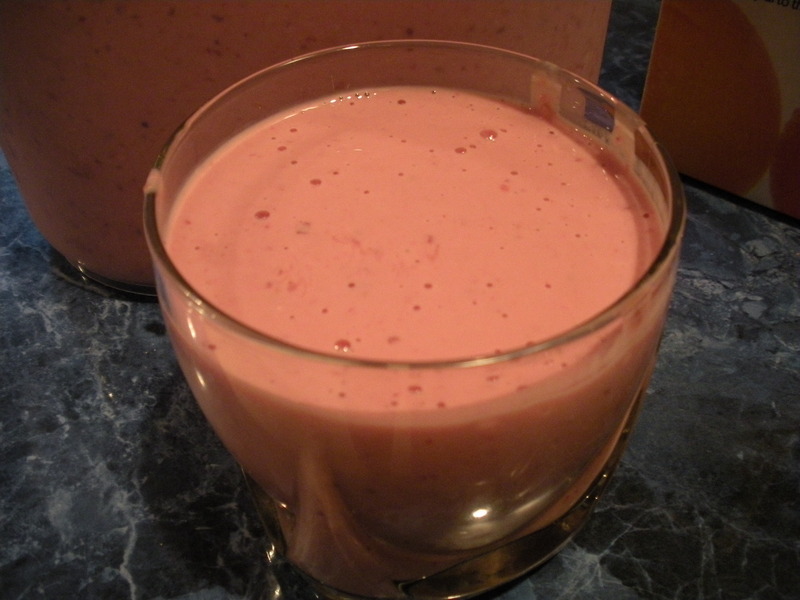 In the meantime, this smoothie is what I drink every morning. It’s filling, nutritious and tastes great. One thing I love about smoothies: you can add just about anything to it. Any kind of fruit and some veggies will go well in this recipe. I make a gallon at a time. You can cut ingredient portions to make less. Occasionally, I end up with more than a gallon, depending on the amount of OJ I add. 2 32 ounce containers of Greek yogurt. 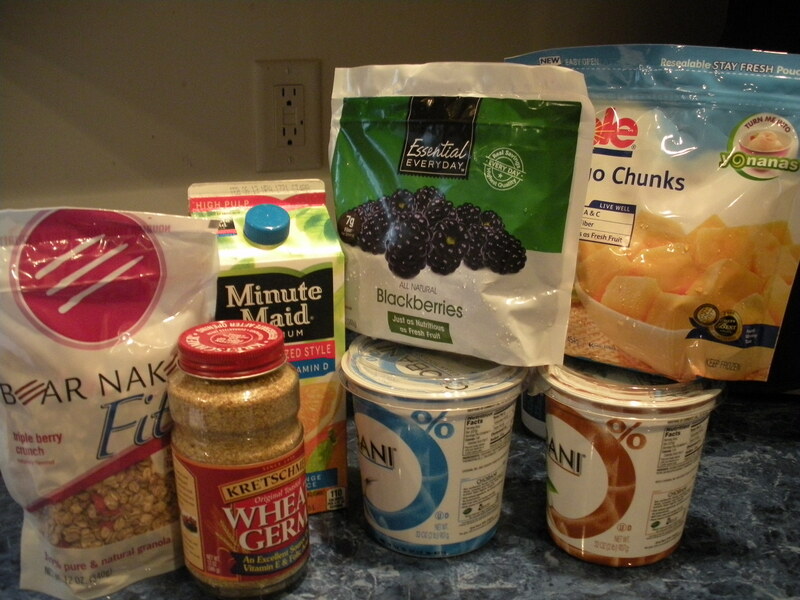 I use the Greek yogurt because it has less whey (the liquid on top of the yogurt) and more protein than regular yogurt. One container is plain, the other vanilla. About 5 cups total fruit, cut into chunks if needed. I have been using frozen because I’m lazy. If you use frozen, you will want it partially or completely thawed. If processed frozen with the OJ, you will end up with the blades of your blender all gummed up. Any kind of fruit you like is fine. I always use mango. I have also used blackberries (only once-I hate the seeds! ), dark cherries, blueberries and strawberries. 1 12 ounce bag of granola. I always use Bear Naked Fit. It is lower in calories and sugar. Use whatever you like. 1/2 cup of wheat germ. This adds a good dose of several vitamins and minerals. Orange juice. You will need a minimum of 3 cups. I add as I am blending, so you can expect to add a bit more than 3 cups. I also add a fiber supplement. The clear, tasteless, flavorless, smooth textured kind. The brand I use has 5 grams of soluble fiber per heaping teaspoon. 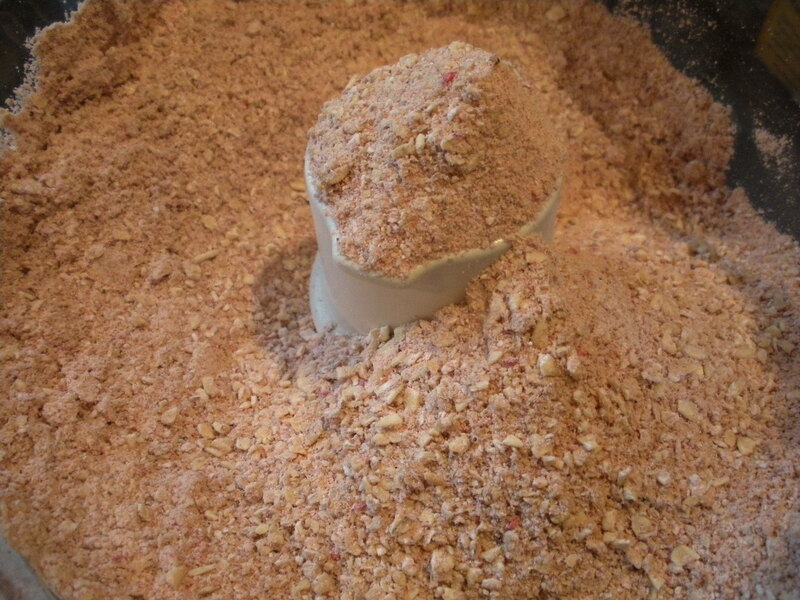 In a food processor (blender if you don’t have a food processor), process the granola and wheat germ until fine. Set the granola mixture to the side. In a blender, pour in half of the fruit and about a cup and a half of orange juice. Blend until smooth, adding more OJ if needed. 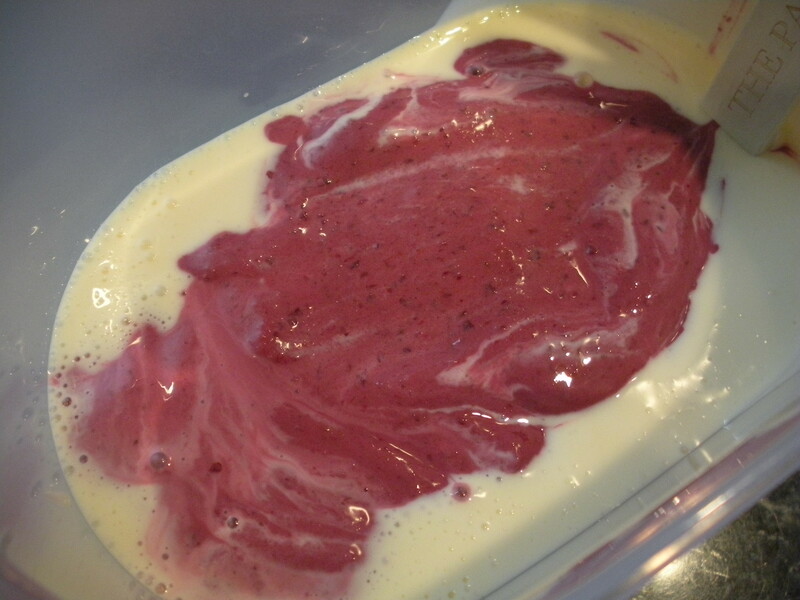 Add 1/2 container of yogurt and blend again until smooth. 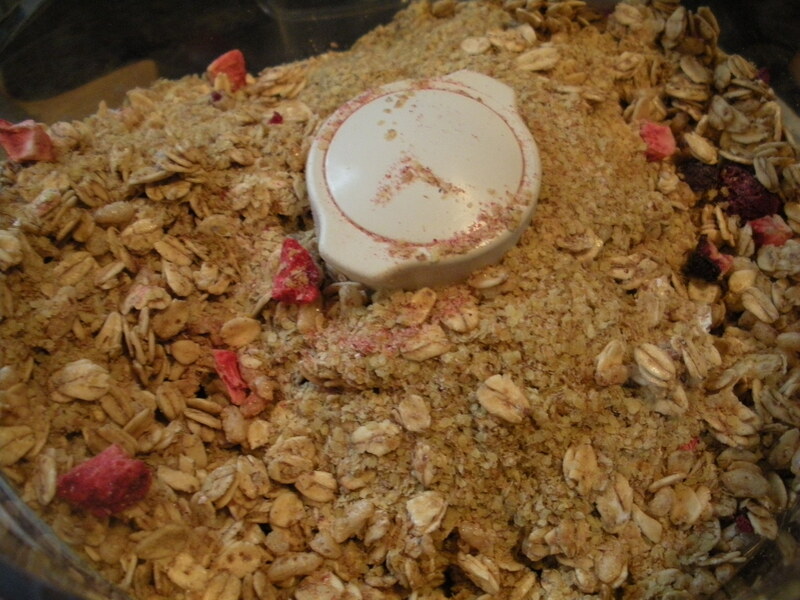 Add some of the granola mixture and blend again. Pour the mixture into a pitcher (or whatever you plan to store the smoothie mixture in). Repeat until all of the ingredients have been blended. Once all are blended, stir all together in the pitcher. If the smoothie is too thick, just add more OJ. I add OJ to my cup to thin out individual servings until I have enough room in the pitcher to add OJ directly to the pitcher. I generally end up with a thicker smoothie that is more like an ice-cream shake than a smoothie. Enjoy! Up next, something from the grill!!! Until next time, Grill, Baby, Grill! The Chuck Wagon Beans recipes I have encountered are full of green and lima beans, not baked beans. I really do not like green beans and I hate lima beans and wax beans. Thankfully, my Mom never made those recipes! This is the recipe I was going to prepare when I ended up making Baked Chili. My mom made this frequently when I was growing up. I am one of 6 kids. When she made this, it would never last. The recipe below is half of what my Mom would make. Double it and take Chuck Wagon Beans to a potluck. It is only slightly changed from Mom’s original. Preheat oven to 375 degrees Farenheit. Brown 1 1/2 pounds of ground beef, adding about 3/4 cup of diced onion when the beef is nearly completely browned. Drain. 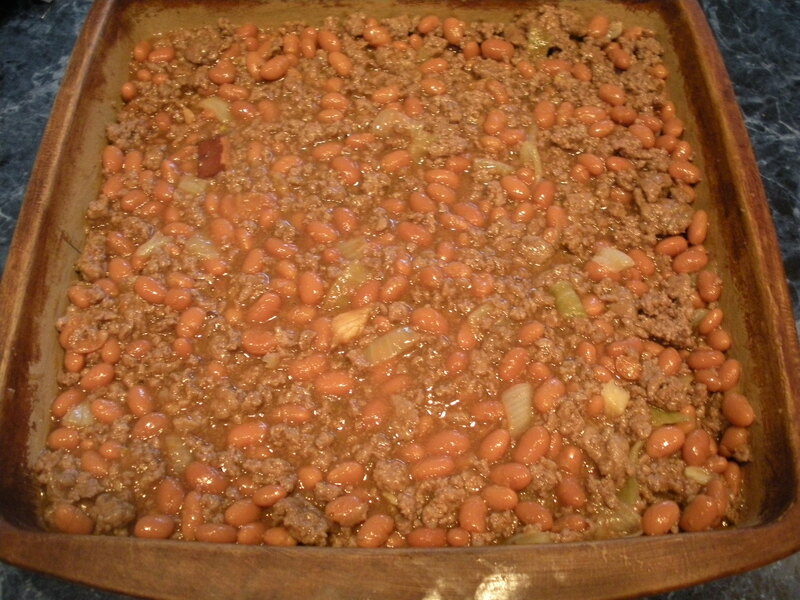 In a greased 9×9 pan, pour in the beef and onion, adding the following: 1 28 ounce can of baked beans, 1/3 cup beef broth, 1/2 cup ketchup, 1/4 cup barbecue sauce, 1 1/2 tablespoons dried ground mustard, 1 garlic clove, minced and 1/4 ounce fresh grated ginger (or 1 to 2 teaspoons ground). Mix well. 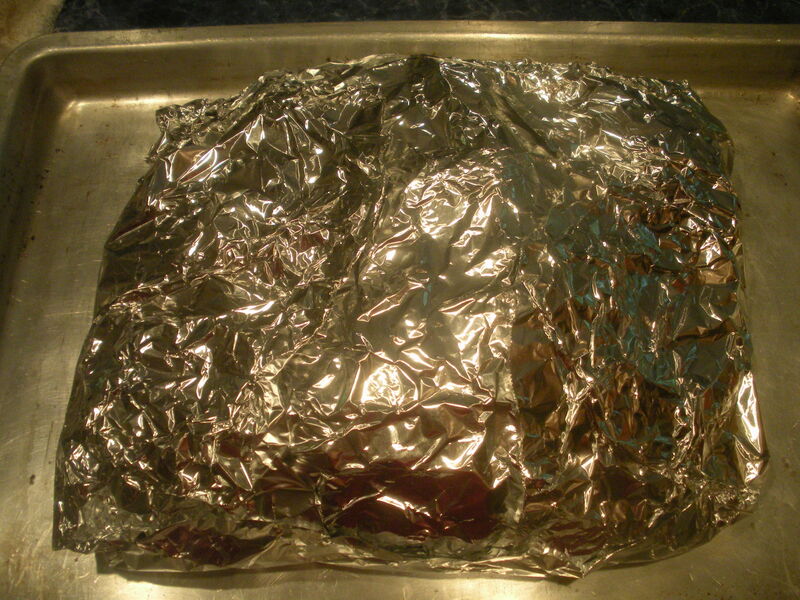 Cover with foil and place in oven. Bake for about 45 minutes. 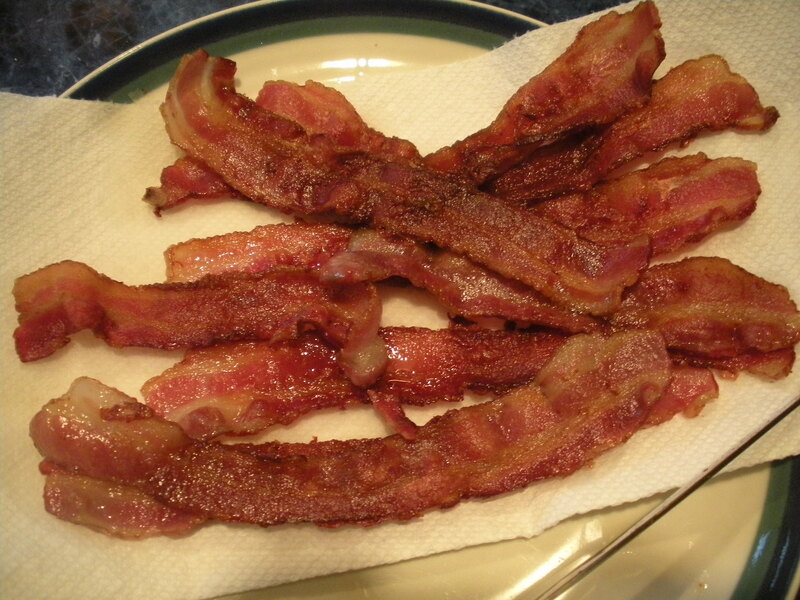 While the beans are baking, fry 6 slices of bacon until crisp. Crumble. Bacon-nothing more to be said! 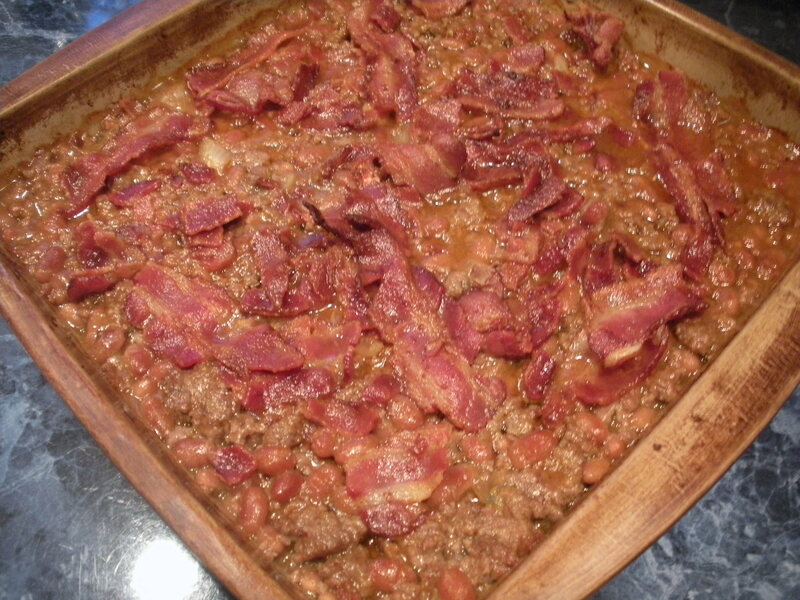 After 45 minutes of baking, remove the foil and sprinkle the crumbled bacon over the beans. 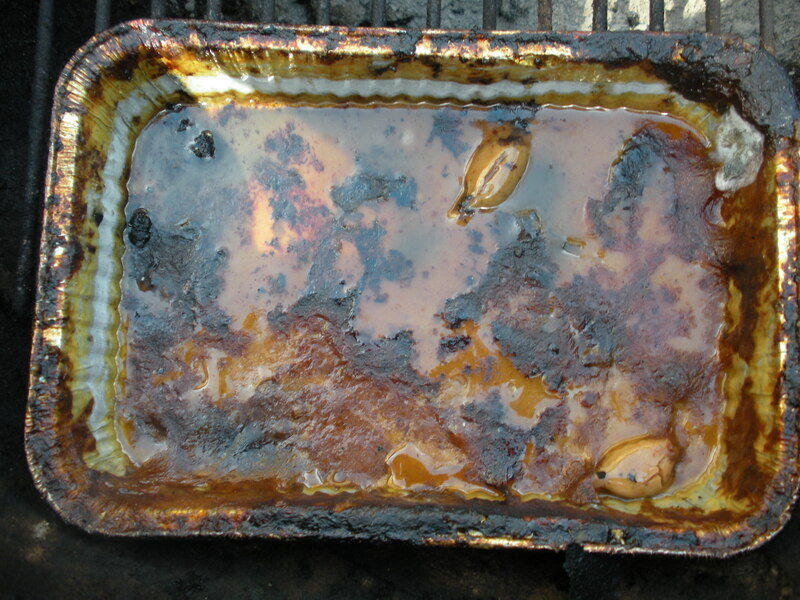 Put back in the oven for another 5 minutes, uncovered. Remove from the oven and let it sit for about 10 minutes before serving. This recipe is a good candidate for the dutch oven (read more at the preceding link). Cast iron cooking with a bit of natural smoke flavoring added! Enjoy! Until next time, Grill, Baby, Grill! Here in Central PA, today, the day before Ash Wednesday, is Fasnacht Day. Not Shrove Tuesday, not Fat Tuesday, not Mardi Gras. Fasnacht Day. It’s a day to indulge, but not the way it is done in New Orleans or other places. No, it’s doughnut day. Woo ha! A Fasnacht is a fried doughnut consisting of lard, sugar, butter and flour. Want a heart attack? Eat one of these. I’ve lived here for 16 years and have eaten a total of one, because that was all I could stand. Just the thought of eating one makes my stomach shrivel. It’s one of those things that stays with you for days and feels like your carrying around a lump of coal in your stomach. Traditionally, Fasnachts were made not to celebrate, but to rid the pantry of those items not allowed during Lent., i.e., the fat used to prepare so many of the Pennsylvania Dutch recipes. Sometimes, the doughnuts are made with potatoes. So many traditional PA Dutch recipes are made with potatoes, butter or lard and flour. Very starchy and somewhat bland (in my opinion). Very soon, another PA Dutch tradition will arrive in time for Easter-Peanut Butter Eggs. Watch for ’em! Enter your email address to subscribe to A Girl and Her Grill and receive notifications of new posts by email.